Gas–phase (U)B3LYP/6-311++G(d,p)//(U)B3LYP/6-31G(d) computations give critical points outlined in the reaction below. The structures of the transition states and the intermediate are shown in Figure 1. The PES indicates a rebound mechanism, though in acetone solution phase, there was no transition state located for the second step; it appears to be barrierless. It should be noted that the size of the barrier is very small even in the gas phase. The energy given in Figure 1 is for the gas phase structure computed in solution. Trajectories for both gas and solution phase were computed. 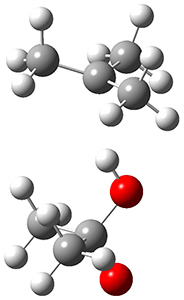 For the gas phase, about 90% of the trajectories lead to separated radicals, but in an acetone about 90% of the trajectories lead directly to the alcohol, with only 10% leading to radicals. 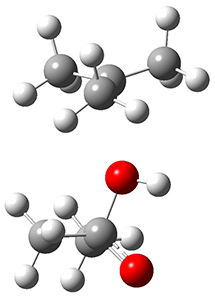 Even so, the acetone trajectories divide into two types, a dynamically concerted path where the time gap between the formation of the new C-O and O-H bonds is less than 60 fs, and a dynamically stepwise path where the time gap is greater than 60 fs, though for the trajectories that lead to product the gap is typically still less than 150 fs. (1) Yang, Z.; Yu, P.; Houk, K. N. "Molecular Dynamics of Dimethyldioxirane C–H Oxidation," J. Am. Chem. Soc. 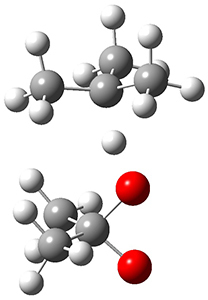 2016, 138, 4237-4242, DOI: 10.1021/jacs.6b01028.